... to nicely curated tables of collections and sellers napping on shoeboxes. (That was a sight to see!) Foamposites in a rainbow of colors, KD’s as far as the eye could see, and an array of customs (some of which being touched up right in front of your eyes) were on display in full force. Not to be missed was an appearance from New York’s very own Iman Shumpert from the Knicks for photo ops with fans. One of the best parts of the show for us however, was the inevitable runway that it became for sneakerheads of all breeds. 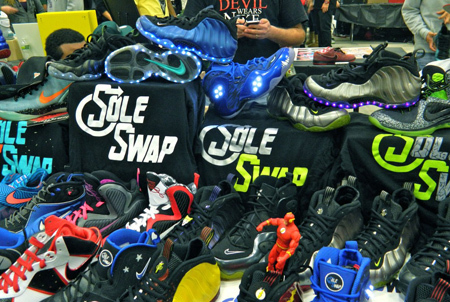 From the youngsters selling a pair or two as they walked the floor, to the mini-sneaker fans helping out parents at their tables, there was some serious swag happening. We definitely had a blast and can’t wait for next year. 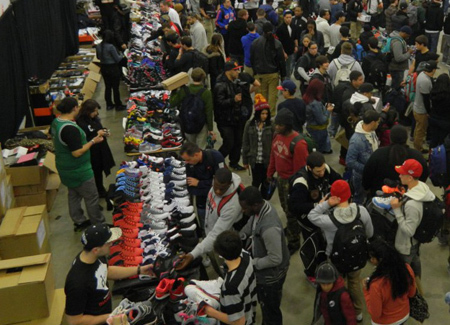 If you aren’t in New York or missed it this time around, make sure to check out the Sneaker Con website for more locations, including the last two of the this season:Charlotte, NC (December 8th, 2012) and Atlanta, GA (January 2013).